Heat 2 teaspoons oil in large skillet over medium heat. Add shallots; cook and stir 5 minutes or until tender. Add mushrooms, cook and stir 8 minutes or until softened. Stir in 1 clove garlic, 1 tablespoon thyme and 1 1/2 teaspoons parsley; cook and stir 1 minute. Pour dry sherry into skillet. Bring to a boil over medium heat; boil 2 minutes or until sherry is reduced by about half. Cool slightly. 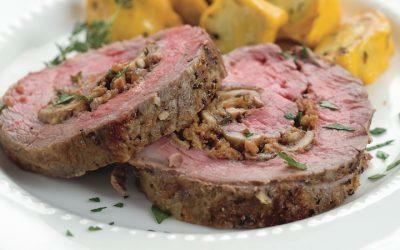 Cut beef tenderloin lengthwise. (Do not cut all the way through). Open up beef; cover with plastic or waxed paper. Pound using meat mallet to 1/2-inch thickness. Stir bread crumbs into mushroom mixture; spread evenly onto center of beef, leaving 1-inch border around edges. Roll up beef jelly-roll style. Secure with kitchen string at 1-inch intervals. Place beef on rack in shallow roasting pan. Combine remaining 2 teaspoons oil, 2 cloves garlic, salt and pepper in small bowl. Rub mixture evenly over beef. Roast 35 to 40 minutes for medium rare (135°F) or until desired doneness is reached. Remove roast to carving board; tent loosely with foil. Let stand 15 to 20 minutes before carving and serving. Sprinkle with additional thyme and parsley, if desired. *Note: To make fresh bread crumbs, tear 1 slice bread into pieces; process in food processor until coarse crumbs form. Exchanges per serving: 1/2 Bread/Starch, 3 Meat.